As we move further into the twenty-first century it is interesting to note some of the changes in perspectives that have occurred among “us” over the last two hundred years. One particular shift is quite a radical one, at least in some quarters. It is a shift from call for radical revision of the 1611 King James Version, or its total replacement, to irrational defenses of the King James as the only true Bible. It is a shift from demands for contemporary vernacular translation based on the most up to date critical Greek & Hebrew texts to retreat to the Textus Receptus. This reorientation became most visible with such giant luminaries as Foy E. Wallace Jr., one of the most influential men among Churches of Christ. Wallace published a massive tome with the intimidating title A Review of the New Versions: Consisting of an Exposure of the Multiple New Translations in which he sets up the KJV as supreme and rabidly attacks all modern translations – including the ASV . In the Introduction to Wallace’s work, George DeHoff praises the KJV as brightening the “Golden Age of Literature” and dares to claim “the King James Translation of the Bible brought the church to us. It was the translation of the Restoration Movement.” Wallace goes further in his own Preface to say that the KJV was the Bible of the Movement. He claims the KJV was the Bible for Campbell, Franklin, Harding, Lipscomb and then pointedly says “the statement that the King James Version was not the Bible of the Restoration is a stupid statement”. I plan on exploring that “stupid statement” in some detail, are DeHoff and Wallace correct in their claim? By the time Alexander Campbell immigrated to America, European civilization had occupied the land for over 200 years. In that time a plethora of translations had been made available to the reader. French Bibles and Luther’s German Bible were available and read in North America . In the British colonial period the first English Bible in America was the Geneva Bible. Yet by Campbell’s arrival the common version of the people was the King James Version. The young Campbell was, however, quite dissatisfied with the “Authorized Version”. Early in his reforming and publishing career, Campbell began calling for a revision, or the outright replacement, of the common version. For Campbell, reforming the church was historically linked to God’s word being put afresh in the vernacular of the common people. He wrote in his journal, the Christian Baptist, “it is a remarkable coincidence in history of all the reformers from Popery, that they all gave of the scriptures in the vernacular tongue of the people whom they labored to reform”. In four brief articles Campbell sketched out the history of the English Bible from “Wickliffe” through Tyndale, the Geneva Bible, the Bishop’s Bible and finally the King James Version. Reformation, according to Campbell, simply could not take place because the KJV was no longer in the clear language of the people and it contained many translation errors. Citing James MacKnight as his authority, Campbell argued the KJV frequently departed from the Hebrew to follow the Septuagint or the Latin Vulgate in the “Old Testament. The Common Version had too many “Latinisms” to be intelligible to the ordinary reader and, interestingly enough, it was too “literal” in translating Hebrew and Greek idioms. He declared that the translators allowed the King’s notions of “predestination, election, witchcraft, familiar spirits” to influence their work of translating. Further many passages, Campbell said, were simply mistranslated and finally the division of verses into individual paragraphs severely hampered following the flow of thought for the ordinary reader . The only way to remedy “those evils” in the KJV “so long and so justly complained of,” was to issue a new translation of the New Testament. This is exactly what Alexander Campbell proposed to do using the works of “Doctors Campbell, MacKnight and Doddridge” as a base and revised in the light of Johann Jakob Griesbach’s critical Greek New Testament. On April 19, 1826, Campbell announced to his readers that the new version, that is The Sacred Writings of the Apostles and Evangelists of Jesus Christ, Commonly Styled the New Testament, translated from the original Greek by George Campbell, James MacKnight, and Philip Doddridge, Doctors of the Church of Scotland, with prefaces to the historical and epistolary books with an appendix, Buffaloe, Brooke, Co., Virginia, Printed and Published by Alexander Campbell, 1826 was now available. This version became known simply as “The Living Oracles” though to my knowledge this title never actually appeared on the title page until the Fourth Edition in 1835. In his General Preface to the Sacred Writings, Campbell gave an apology for this new translation. His argument consists of two parts: English has changed since 1611 and the KJV is not only hard to understand in places but simply wrong in many. Campbell’s language argument is that living language is like clothing fashions “at one time current and fashionable” and then “awkward and obsolete”. The first example he gives drives home the point with clarity. Referring to 2 Corinthians 8.3 “we do you to wit,” Campbell says “this was, no doubt, a correct and intelligible rendering … to the people of that day; but to us it is as unintelligible as the Greek original”. Then he lists more examples such as “conversation,” “double-minded,” “prevent,” among many more and more that could be listed but he refrains. In his second argument, Campbell addressed the long noted reality that the KJV was anything but a perfect translation. He cites the special influence of Theodore Beza  upon the 1611 translators giving the version a clear “sectarian” character . His final argument is from the advance in biblical studies, especially the knowledge of Greek and Hebrew. He notes that special character of NT Greek, with the LXX influence, has the “body of Greek but the soul of Hebrew” as he correctly put it. The translators of 1611 did not recognize this aspect of New Testament Greek and approached the subject as a classical scholar might. Some may say the translations are literally correct but, according to Campbell, “the King’s translators have frequently erred in attempting to be, what some would call literally correct. They have not given the meaning in some passages, where they have given a literal translation”. Campbell ended by arguing that Christians now have a more accurate Greek text from which to translate than was available in 1611. The version by Campbell was a daring enterprise for the day. The Sacred Writings has been called the “first modern translation”  because of its dependence on the critical Greek text and its move toward current modern English. Because Campbell intended to maximize readability and comprehension the text of the new version was divided into paragraphs which omitted verse numbers except at the beginning of the paragraph . Alexander Campbell believed these disciples to be badly mistaken to think that only the King James Version was the word of God. Surely such people, Campbell argued, just had not thought through their argument. He asked them, if the KJV is truly the only word of God then “have the French, the Spanish, the Germans, and all the nations of Europe, save the English, no Word of God?” Then the Translator states “I would thank some of those ignorant declaimers to tell us where the Word of God was before the reign of king [sic] James!”  He goes on in bold language “taken as a whole, it [KJV] has outlived its day at least one century, and like a superannuated man, has failed to be as lucid and communicative as in its prime” . The chart clearly demonstrates movement to modern and intelligible speech. ‘I don’t know,’ said the elder, defiantly ignorant. ‘Was it not about two hundred and twenty years ago?’ Smith asked of the clerk, who, perhaps had read more than his brethren. ‘I believe it has been about that time,’ he replied. “it is a mistake that the reformation was based upon it [KJV]. Alexander Campbell rejected it, adopted MacKnight and Doddridge’s and did more to bring about the late revision [the RV of 1881] than any other man on earth” . Throughout the 1830s, Campbell defended his new version from attacks, especially those of O. Jennings. These articles explored the proper understanding of faith in Ephesians 2.8, the proper translation of ekklesia , and the proper rendering for baptizo . The series ends with Campbell discussion the proper translation and the textual variants of Acts 20.28 and Titus 2.13. In 1835, Campbell continued his quest for a readable, and accurate, English Bible in a series of articles exploring “Mistranslations” in the King James Version. It was Campbell’s opinion that the KJV provided many opportunities for skeptics to attack “the inspired authors” of the Scriptures when the fault was really the 1611 translators who mistranslated the text. Focusing on the first book of the Hebrew Bible, Genesis, Campbell lists a number of mistranslations that had given skeptics much delight. I will highlight two of them. Genesis 1.6 in the KJV reads “And God said, Let there be a firmament in the midst of the waters, and let it divide the waters from the waters.” The King’s translators followed the Latin Vulgate, not the Hebrew, argued Campbell. The Hebrew rakeea properly means “the expanse or space.” The modern philosophists, as Campbell calls them, laugh at the false teaching of this verse in Genesis 1 of the King James Version. But Moses, Campbell declares, teaches “the true wisdom, saying, ‘And God said, Let there be an expanse [or space or atmosphere]in the midst of the waters, and let it separate the waters from the waters“. It is worthy of note that the NIV reads “Let there be an expanse between the waters …” confirming Campbell’s linguistic skill. Another passage that has been extensively used in our debate tradition, Genesis 6.14, comes under Campbell’s microscope. The Genesis text reads in the KJV, “Make thee an ark of gopher wood.” This is not even translation Campbell exclaimed! It is simply the Hebrew word in English letters . The Septuagint rendered it as “squared timber” (not any particular type of wood at all!). The Hebrew gopher meant simply “cypress.” God had told Noah to use a broadly defined family of trees, cypress trees, and that is exactly what ancient shipbuilders used according to Campbell. Again it is worthy of note that the NIV renders the word exactly as Campbell suggested in 1835, “make yourself an ark of cypress wood.” These are just a few of Campbell’s many examples from Genesis that he believed warranted a fresh translation of the Hebrew Bible into English. Walter Scott threw his weight behind the plea for a new version of the Bible too. Looking at the history of “Old Testament” translation pointing out some of the new versions by Pagninus that were “extremely literal, and by this means, are rude, barbarous and often obscure” . Others however are not even based upon the Hebrew, he argues, but on Latin. Scott pointed out that 200 years of learning had passed since the KJV was received off the press and regardless of its merits, knowledge has in fact progressed and surpassed the state of the question in 1611. “In all respects of biblical criticism, much has been developed and redeemed with that period [i.e.1611-1832]. The Original languages, the languages kindred to them, are now much better understood than in the days of King James. Manuscripts and editions are better known and more numerous … The Scriptures themselves in all circumstances of scope, design, occasion, doctrine, morals, manners and customs are better comprehended” than in 1611. Scott proposes to do for the “Old Testament” what Campbell had done for the New Testament. He proposed that Christians should avail themselves to the best of modern scholarship as represented in Kennecott, Michaelis, Horsley, Lowth, and other scholars for a new version of the Hebrew Scriptures. Robert Lowth’s Isaiah, Horsely’s Hosea and others should be bound in a single volume for a new Old Testament. A new version was simply imperative for American readers . This resolution led to the immediate resignation of Spencer Cone, the President, and the withdrawal of many delegates; these men then formed the American Bible Union. The ABU stated in its constitution that its main object was to “procure and circulate the most faithful versions of the Sacred Scriptures in all language throughout the world.” This included English. During decade of the 1850s the Millennial Harbinger carried numerous articles calling for the revision of the King James Version and reports on the work of the Bible Union. From time to time notices were published of Scripture portions that had been revised and had become available. Campbell, for example, wrote excitedly about Dr. Conant’s new version of the Book of Job. He wrote “We recommend it as a specimen to our readers and to the world, as an INCONTROVERTIBLE argument in FAVOR of the value and IMPORTANCE of the New Version” . S. E. Shepherd published a note on the revision of 1 Peter 2.13-14, a passage that bears the mark of royal influence in the King’s version designed to make it favor the “supremacy of the king” . The Restoration Movement did more than talk about revision in the decade of 1850-1860 rather they led the way hands on. Representatives of the SCM were heavily involved with whomever would join them in the cause of revision – especially Progressive Baptists. Both Tolbert Fanning, President of Franklin College and founder of the Gospel Advocate and B.F. Hall were signers of the Constitution of the American Bible Union. Alexander Campbell, James Shannon, John T. Johnson, Philip S. Fall, James Challen, and Tolbert Fanning all served as Vice-Presidents … this is a list that reads like a Who’s Who in the Stone-Campbell Movement! Walter Scott was a manager and Ben Franklin addressed the ABU in 1854 . Jacob Creath, Jr was one of the many famous preachers in the SCM who became a field agent for the Bible Revision Association . However there was considerable opposition to the work of the ABU among the Baptists but there is not a trace of it from Disciple writings of the period. The Amity-Street Baptist Church in New York City opposed the revision on the grounds that the KJV was already the best translation in the world. Rev. Williams, the author of the church’s letter to the ABU, also censures the group for allowing Alexander Campbell and other SCM leaders to be involved – people guilty of heterodoxy . These minor modernization’s and corrections are, he charges, “changes in the sacred text”. Robert Richardson responded to the idea that new versions will cause doubt towards the Bible or create division. He argued instead of Bible study suffering from revision it will be enhanced. 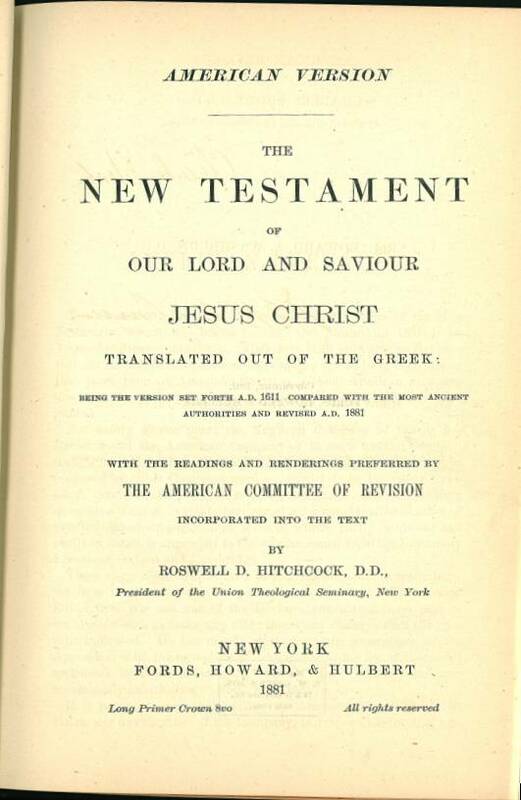 “Lovers of Divine Truth,” Richardson wrote, “will delight to find in the clearer language of the new version, the solution of many difficulties which have been created by the obscurities and imperfections of the common translation.” Multitudes who previously had no desire to study will not do so with the arrival of the new version. Restoration involvement with the ABU culminated with Alexander Campbell’s revision of the Acts of the Apostles. Campbell having addressed the convention on at least four occasions regarding various aspects of Bible translation into the vernacular  published his revision in 1858. Campbell’s revision retains much of the vigor of the Living Oracles. Campbell retained the reading “Lord” in Acts 20.28 giving his reasoning in his Notes . While Campbell was in his golden years and America was torn apart by a bloody conflict, many disciples still continued to dream of a current speech translation. Henry T. Anderson was one such dreamer. Anderson was a scholarly preacher from Harrodsburg, KY and he published a fresh translation of the NT. He says in his Preface that he made his translation with no thought to the phraseology of the KJV. He did not feel bound by Greek structures but wished to express the “sense of the Original” in “good English” . The New Testament is printed in paragraphs with good spacing between the lines. Moses Lard states the volume was “one of the most elegant and appropriate in appearance we have ever seen” . There are no footnotes of any kind, however page 568 lists current values for money. Anderson’s version was excitedly received by leading lights of the day being praised by Robert Milligan, J. W. McGarvey and Ben Franklin. David Lipscomb used Anderson’s version along with the Living Oracles, the Bible Union Version along with the KJV during his family devotionals . “Anderson has certainly aimed at simplicity in his translation; and we are glad to say he has, in the main, succeeded well. Still in very many passages we think it decidedly at fault in this respect. We should always prefer two or three or even more simple easy words to one learned or unfamiliar one, in making a translation” . Anderson’s version aimed at being a completely fresh and modern language New Testament. Lard’s minimal quarrel with Anderson is that it was not simple and modern enough. Lard published a lengthy article in 1864 on the subject of “Translations and Revisions.” The article is really about translation theory and is, perhaps, the only article in the 19th century written within the Stone-Campbell Movement on translation theory. Lard greatly criticizes the translation rule of the ABU that directs that translation be done with “corresponding words and phrases.” This rule, apparently adopted by the 1611 translators too, leads to all manner of false readings. Lard says “whether the sense of a sentence in one language shall be translated by corresponding words and phrases of another is a circumstance which can never in the least enhance the excellency of a translation, but may very seriously injure it” . Too literal a rendering of one language into another obscures meaning rather than enhances it. Exactitude in translation is the goal, but that means the sense of the original being understood in the receptor language . “The practice of some translators literally stuffing their translations until every sentence on the like a bloated thing can not be too severely reprehended. With such every kai, and de, and men and ho must have some corresponding representative. Thus the ease and perspicuity of the English are lost in clumsy attempts to make it walk on Grecian stilts” . The SCM continued to seek replacement for the KJV. Charles Louis Loos announced in the Millennial Harbinger the planned major revision of the KJV in England. Loos writes this has been Restoration Movement’s plea from its beginning, now “we have many reasons to rejoice.” The revision will not be as thorough as the SCM had advocated but “it doubtless will be a great improvement” . James Lillie wrote on the need for “Bible Revision” and spared the 1611 KJV the usual flattering statements. To Lillie the translators were really hirelings and falsifiers of God’s word. He accuses them of being “stealers” of another man’s labor – William Tyndale and claimed it as their own . 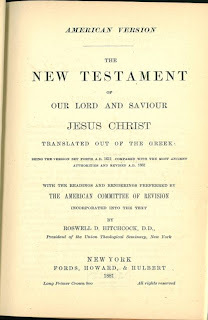 W. K. Pendleton, in 1870, published excerpts from R. C. Trenche’s On The Authorized Version of the New Testament concerning the necessary distinctions that are hidden in the KJV. In this short article, Trench demonstrates in numerous passages that the 1611 translators had mistranslated the text . “I can most heartily advise all who are interested in Bible study to get the ‘American Revised Version’ and read it. I believe it to be the best translation of the Holy Scriptures ever made into the English tongue. The quotations made by the editor in his articles in The Way are from this version” . With the dawn of the twentieth century and James A. Harding I bring this blog article to a close. Looking back however we see from the first articles by Alexander Campbell in the Christian Baptist to Harding in The Way there has been a consistent voice in the Stone-Campbell Movement. That voice was united in declaring the King James Version as an inadequate translation in need of drastic revision or complete replacement with a fresh translation. Many “denominationalists” opposed revision of the KJV. They published books, articles defending the KJV, and even eventually destroyed a good thing in the American Bible Union. Yet the most striking fact to emerge from my study of the many journals and many articles that have not been referred to due to space is this: there is not a single defense of the King James Version written by a member of the Stone-Campbell Movement whether “liberal” or “conservative” in the nineteenth century! From the Millennial Harbinger, to the Evangelist, to Lard’s Quarterly, to the Christian Record, to the Gospel Advocate, the Way, the Protestant Unionist, and the Christian Standard there is not one single article written protesting the revision and/or replacement of the King James Version on the basis of modern critical Greek texts or putting it into into “Words Easy to Be Understood.” I think this is a significant fact. The phrase “in words easy to be understood” comes from a speech by James Shannon at the Bible Revision Convention in 1852. These words of Shannon encapsulate the almost unanimous voice of the 19th century Stone-Campbell restoration movement’s demand to have an accurate, clear and understandable English Bible. See “The Importance of Procuring a Pure Version of the Scriptures,” in Proceedings of the Bible Revision Convention, Memphis, Tennessee, April 2, 1852 (Louisville: Hall and Brothers, 1852), 48. Richard T. Hughes, Reviving the Ancient Faith (Grand Rapids: Eerdmans, 1996), 160-166. A Review of the New Versions, 3rd edition (Fort Worth: Foy E. Wallace Jr. Publications, 1973, 1976). ibid., XV. It is not infrequent to hear writers attribute to the KJV with having a great impact upon the English literary tradition. C. S. Lewis does not agree with George DeHoff however. He writes of that the KJV “as a strict literary influence” is far less than supposed. See C. S. Lewis, The Literary Impact of the Authorized Version (Philadelphia: Fortress Press, 1963), 26. P. Marion Simms, The Bible in America: Versions That Have Played Their Part in Making the Republic (New York: Wilison-Crickson, 1936), 65, 68ff. Simms notes that the first printed Bible in America was Eliots Indian Bible printed in 1663 (pp. 189-192) and the first Bible printed in a European language was the Saur German Bible in 1743 (pp. 120-125). Alexander Campbell, “King James Instructions to the Translators of the Bible – With extracts and remarks,” Christian Baptist 2 (1 November 1824), 104-105. All references to the Christian Baptist: Seven Volumes in One, ed. Alexander Campbell and Revised by D. S. Burnett. Alexander Campbell, “History of the English Bible, No. 1” Christian Baptist 7 (7 February 1825), 130. Alexander Campbell, History of the English Bible, No 2-4,” CB 2 (7 March 1825), 136; CB 9 (4 April 1825), 66-67; CB 2 (6 June 1825), 160-161. It is fascinating to see that in Campbell’s article on Tyndale he asserts that Tyndale did not translate from Greek but from Latin into English, “Tyndale translated, as Wickliffe before him, from the Vulgate Latin and not from the Greek.” “History of the English Bible, No. 2” CB 2 (7 March 1825), 136. Campbell, even if he had never seen a Tyndale NT was familiar with John Lewis’ A Complete History of the Several Translations of the Holy Bible and New Testament into English, 3rd (London: W. Baynes, 54, Paternoster Row, 1818). Lewis reprints Tyndale’s Prologue to Matthew on p. 81, “I have looked over againe now with all diligence and compared it unto the Greke …” Campbell seems to have been dependent upon James MacKnight who asserted Tyndale did not know Greek, “it is commonly said that Tindale [sic] made his translation of the New Testament from the Greek; but no such thing is said in any of the editions published by himself or Joye,” MacKnight, Epistles (Grand Rapids: Baker Reprint, n.d) Vol. 1, pp. 13-14. Alexander Campbell, “History of the English Bible, No. 4,” CB 2 (6 June 1825), 82. See C. K. Thomas, Alexander Campbell and his New Version (St. Louis: Bethany Press, 1958), 19. Campbell used the term “Living Oracles” in the General Preface, p. iii. The influence of Theodore Beza has been noted by 20th century historians as well. See the thorough work by Irena Dorota Backus, The Reformed Roots of the English New Testament: The Influence of Theodore Beza on the English New Testament (Pittsburgh: Pickwick Press, 1980). She shows convincingly for this influence of Beza especially through the 1602 Bishop’s Bible printed by Robert Baker. Campbell, General Preface, pp. v-vii. One of the major “shifts” on this point is that 19th century restoration leaders did not hesitate to identify the “sectarian” qualities of the KJV whereas today many simply deny they exist! Edward J. Goodspeed, Problems of New Testament Translation as quoted in Frank Pack, “Alexander Campbell the Scholar,” Restoration Quarterly 30 (1988), 128. The Third Edition of the “Family Testament,” included verse numeration in the margin for the sake of reference, Alexander Campbell, “Historical Sketch and Progress of the New Translation,” Millennial Harbinger (June 1832), 270. Alexander Campbell, NO Title, CB (5 March 1827), 318. The scholarly instincts of Campbell are clearly seen in his commitment to Griesbach’s text. Bruce Metzger writes “The importance of Griesbach for New Testament textual criticism can scarcely be overstated. For the first time in Germany a scholar ventured to abandon the Textus Receptus …” The Text of the New Testament: Its Transmission, Corruption, and Restoration, 2nd (New York: Oxford University Press, 1968), 121. In the Third Edition Campbell appears to have stopped using italics, cf. Alexander Campbell and His New Version, pp. 38, 53. The use of italics to indicate doubtful readings anticipates the RSV printing of John 7.53ff and Mk 16.9-20 in an italicized footnote. Campbell, after the Third Edition, put these spurious readings in an Appendix at the end of the Volume. It is interesting to note that Foy Wallace in his Review of Modern Versions heavily criticizes the RSV for changing and deleting God’s word in each of the places just listed except 1 John 5.7. In reference to the Doxology, Wallace’s final climatic argument for retaining it is the “king’s translators” had all the manuscripts needed to be “sufficient for plenary translation” … whatever that may be (p. 328). On Col 1.14 Wallace says “through his blood has been cast out without even a marginal note.” Wallace asserts this reading is “word for word in the interlinear, and it is evidently in the manuscripts which produced our Bible … there is no reason for expunging it by the later versions” (pp. 447f). It is true that this reading is in Stephen’s Text of 1550 which reads dia tou aimato autou, The Englishman’s Greek New Testament Giving Stephen’s Text of 1550 (Grand Rapids: Zondervan, 1970). Greisbach’s text reads en ho echomen tan apolutrosin, tan aphesin town amarpon, with a footnote explaining the omission “through his blood” was due to mss evidence. The modern critical text omits the reading without a footnote. A Friend of Truth, CB 4 (6 November 1826), 286. Alexander Campbell, “A Refutation of the Foregoing Misrepresentations,” CB 4 (6 November 1826), 287. Alexander Campbell, “Reply to the Foregoing Letter,” CB 4 (7 May 1827), 345-346. Thomas, Campbell and His New Version, 41-42. John Augustus Williams, The Life of Elder John Smith (Nashville: Gospel Advocate, 1956), 146. The Living Oracles was the better choice. Marion Simms while characterizing Campbell’s version as a “sectarian” translation and calling it an “immersion version” still passes on high praise for the Living Oracles. “Campbell was a man of scholarly attainments, and it was the unsatisfactory character of the King James Version that chiefly inspired his effort to provide a better text, and while at it he translated baptizo as he interpreted it. This was unquestionably the best New Testament in use at the time” The Bible in America, p. 249. Alexander Campbell, New Version Defended and O. Jennings, D.D. Exposed, No. 1,” Millennial Harbinger (September 1832), 455-459. Alexander Campbell, “The New Version Defended and O. Jennings, D.D. Exposed, No. 3,” Millennial Harbinger (November 1832), 534-537. Alexander Campbell, “The New Version Defended, No. 6,” Millennial Harbinger (May 1834), 204-208 and “New Version Defended, No.7,” Millennial Harbinger (June 1834), 274-277. These two articles again reveal Campbell’s courage to follow what he believes to be the evidence regardless of the charges of heterodoxy. Alexander Campbell, “Mistranslations, No.1,” Millennial Harbinger (February 1835), 49. Walter Scott, “A Plea for a New Version of the Old Testament Scriptures,” Evangelist (6 August 1832), 170f. Walter Scott, “A Plea for a New Version of the Old Testament Scriptures, No. 2,” Evangelist (3 September 1832), 193-198; “A Plea for a New Version of the Scriptures, No. 3,” Evangelist (3 December 1832), 274-277. Scott includes a sample of current Jewish translation of the Hebrew in his No.3, p. 276. Donald Jackson, The Place of the American Bible Union in the History of the Restoration Movement, Unpublished Guided Research Paper, Harding Graduate School of Religion, 1979. Jackson’s work is an excellent place to begin for information on the Disciples involvement in the ABU. C. L. Loos writing in 1870 recognizes this decade as full of agitation for revision of the King James Version. He writes, “after the high wind of excitement of the subject of Bible revision that passed over us from 1850-1860, a calm followed,” Millennial Harbinger (November 1870), 617. The primary reason for the “calm” was the unsatisfactory course the ABU itself took with its revision … and the Civil War. It is curious that Barton Stone’s journal, the Christian Messenger never carried any articles dealing directly with versions. This is true over the life of the journal (1826-1844). Proceedings of the Bible Revision Convention held at Nashville, April 7, 8 & 10, 1854 (Louisville: Hull and Brothers, 1854). Franklin’s address is not recorded in the Proceedings but is said to have given “an exceedingly able address in favor of our enterprise,” p. 19. Jacob Creath, Jr, “Mr James Taylor, the Common Version and the 24,000 Errors, No. 1,” Millennial Harbinger (January 1858), 32-34. A. C. Coxe, An Apology for the Common English Bible (Baltimore: Joseph Robinson, 1857), 8-9. ibid., 31, 34. A more recent writer within the Churches of Christ makes a similar argument regarding modern language versions. He writes, “Each student who is at all familiar with the new Bibles would expect to have this challenging danger point out somewhere in a study like this. On a scale never before imagined,’ the Bible reader is confronted with, ‘A TOTALLY DIFFERENT TYPE OF LANGUAGE.” The writer further asserts that if it doesn’t sound like the Bible then it is “not the Bible.” Robert R. Taylor, Challenging Dangers of Modern Versions (n.p. n.d.), 49, his emphasis. F. M. Carmak, “Bible Revision,” Gospel Advocate (April 1857), 102. Campbell addressed the Bible Union on Oct 3, 1850 on the subject “Improved Version of the Bible,” Millennial Harbinger (October 1850), 553-586; again in 1851, “The History of the English Bible, An Address by Alexander Campbell,” The Bible Union Quarterly, No. 3, (November 1851), 118-152; again in 1852 on “The Importance of a Pure Version of the Christian Scriptures,” Millennial Harbinger (January 1852), 5-42, and “Address by A. Campbell,” Proceedings of the Bible Revision Convention, 1852, pp. 134-159. Alexander Campbell, Acts of the Apostles translated from the Greek, on the Basis of the Common English Version with Notes by Alexander Campbell (New York: American Bible Union, 1858), 138. Campbell shows himself to be aware of, and makes use of, the best scholarship of his day, including German critics in English translation. For more on the context of Campbell see Thomas H. Olbricht, “Alexander Campbell in the Context of American Biblical Studies, 1810-1874,” Restoration Quarterly 33 (1991): 13-28. H. T. Anderson, “Dedication and Preface,” to The New Testament translated from the Original Greek. The title page is missing but a date of March 1864 appears in the Preface. Moses Lard, “H. T. Anderson’s Translation,” pp. 190, 191. Moses Lard, “Translations and Revisions,” Lard’s Quarterly 2 (October 1864), 79. ibid., 83. One hundred and seven years after Lard, J. W. Roberts subjected the “Principle of Literalness as a Criterion of Bible Translation” to a shorter critique than Lard but comes to similar conclusions. Such a theory is “literary checkers.” Restoration Quarterly 14 (1971), 155-167. James Lillie, “Bible Revision,” The Christian Quarterly (July 1874), 337-359. David Lipscomb, Jr. “Which Version of the Bible is Best?” Gospel Advocate (7 January 1926), 3-4. This entry was posted on Saturday, March 3rd, 2012 at 9:06 pm	and is filed under Alexander Campbell, Bible, Church History, King James Version, Restoration History. You can follow any responses to this entry through the RSS 2.0 feed. You can leave a response, or trackback from your own site. FYI: The Living Oracles is available free through the app PocketSword for iPhone or Android. Search for it in the phone’s app store. and, the “Apostle’s Bible” is an English translation of the Septuagint, also available free for PocketSword. Thanks for the extensive research and very interesting article. Why is there not one single English translation of the Bible, from William Tyndale’s Bible in the 1500’s to the recent ESV Bible, that translates Acts 2:38 and other “baptism passages” in the manner that Baptists say that they should correctly be translated? Answer: the Catholics, Anglicans, and Lutherans secretly conspired together to purposefully mistranslate God’s Word. Therefore, no accurate translation of the Bible exists today in English or in German. Is there any evidence of this grand conspiracy?